8 Unconventional bedside table ideas! From essential items like water, books, a glowing lamp, to the more decorative ones like flowers, and personal items like framed pictures; you'll agree when we say that a bedside table is a much needed companion for a comfortable night by the bed. But, we believe that like any other piece of furniture, a side-table need not always conform to the conventional norms! A little imagination can save you some money, as well as help you go the ecological way by re-purposing furniture! Let's sail through some exciting and unconventional bedside table ideas to get you motivated! 1. A block of concrete. A simple concrete block-turned-side table complements the pared down industrial bedroom well, while keeping the necessities in place! A spare, unused chair can turn functional again as your bedside table to keep essential night time reads and magazines handy! This rustic-chic bedroom serves inspiring idea! 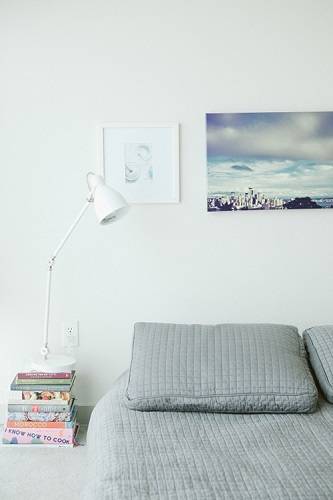 In case of a low level bed, a pile of mounted books with sturdy covers can easily become your makeshift side-table to hold a reading lamp or a glass of water if the need be! Lend a laid back, rustic-chic vibe to your bedroom by upcycling a wood log as a bedside table! Case in point: the relaxed bedroom below. A basic metal drum has been converted into an eye-catching bedside table by painting it as a Chanel perfume barrel. Now, this is called being imaginative! This is definitely not a new trick! Vintage suitcases are ubiquitous as upcycled furniture. We love them as a side-table because there is plenty of space to keep your belongings, plus the height is adjustable to suit your needs! Another fascinating example of upcycled furniture! A portion of an old wood step ladder has been converted into a multi-shelf side-table! Let's end this post with a quirky twist on bedside furniture through this suspended table! Have you any more intriguing ideas on unconventional bedside tables? Don't forget to share with us! 8 out-of-the-ordinary wallpapers to jazz up your walls! Let flowers take the center-stage!